If you're looking for some Easter craft ideas for making projects at home, church, school, or play groups, I've got several really good options for you. Your age doesn't matter when it comes to Easter craft projects. Making Easter crafts is a lot of fun and most projects are usually really simple to assemble. There are craft kits you can purchase like the selection at the bottom of this page, but you can also just use items you have already around the house. I usually buy little craft kits for my Sunday School class each year to make the Resurrection celebration a little extra special. If you are looking for Easter religious craft ideas, they have an inexpensive selection at Oriental Trading Company, Inc.
That's where I sometimes buy mine. The price for each craft can work out to be as little as .50 cents per child. Don't worry, Oriental Trading also has plenty of Easter craft kits for non Christian themes, too. There's over 100 options to choose from, and most of them are under $10. Whether you want to create something with foam, stickers, beads, cardboard, glue, or paper, there are adorable choices. Your biggest problem will be deciding between them! Another cute and clever Easter craft idea is molding chocolates. For a Christian theme, you can get chocolate molds in the shape of a cross, a lamb, a lily, or something similar. That's not all. You can also find bunnies in all different poses, as well as Easter eggs, chicks, baskets, and more. You'll find a nice selection at Candyland Crafts. Of course, Candyland Crafts also has the chocolate melts you need to complete the project. To make your molded chocolates extra special, choose some colored chocolate melts and get a small packet of mini paint brushes at the dollar store. You can "paint" the details on the mold first with the colored melts before filling them with regular chocolate - very cute! Candyland Crafts also has "kits" that you can purchase to save you time in choosing. They even have a cute little cookie house craft kit that the kids can decorate with icing and candy lollies. Make Your Own Easter Crafts! If you prefer to make your own Easter crafts, here a couple of ideas to get you started. Clear cellophane bags - You can probably find them at one of your local shops, but they are also available at Candyland Crafts. Decorative paper - scrap-booking paper works great and can usually be found at the dollar store. Easter candy - foil wrapped eggs look great, but you can choose your own favorites. Template - choose a shape to use as a silhouette for your design. You can drawer your own if you are able (I'm so not! ), or maybe find a picture in a coloring book that you can copy or trace. Ribbon - choose a piece in a color to match your paper. Measure the width and height of your cellophane bag. Cut your decorative paper the same width, but double the height. Trace your template onto top half of the decorative paper and cut it out with a craft knife. Fill the bag 2/3 with your chosen candy. Wrap the decorative paper around the filled bag and use a hole punch to make two holes in the top. Thread the ribbon through and make a bow. That's an easy craft idea to make for a cute Easter gift for any age. I do have to credit that Easter craft idea to a really great Australian decorator Tara Dennis. She's a presenter on Better Homes and Gardens and has her own website taradennis.com. She makes everything look like it's a piece of cake. I really enjoy watching her. For a pretty wall or door hanging, make an Easter wreath. You'll need to choose a "frame" for your wreath. There are a variety of options these days. I've used foam, wire, wicker, and wood. I've even made my own grape vine wreaths from my father's grape vines! You can pick up a wreath form at your local craft store or even Walmart. Decide on what type of "decorations" you want on your wreath. 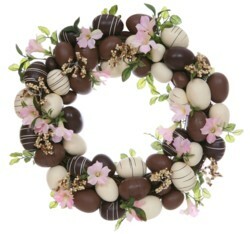 You may want to consider ribbon, flowers, a mini nest with eggs, chicks, bunnies, or even foil wrapped chocolate eggs. Depending on your selection you'll need wire or glue to attach all your decorations. Use your imagination and come up with your own unique masterpiece. Have An Easter Craft Idea? 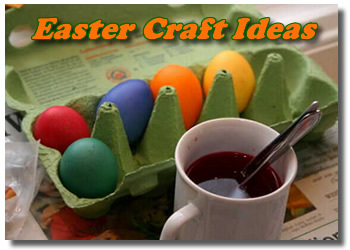 Do you have an Easter craft idea that you picked up somewhere along the way? Share it with the rest of us! If you've actually made it, go ahead and show off. We'd love to see your work.